OCALA, FL (December 21, 2010)–HITS, Inc. is pleased to announce that DeLuca Toyota will be the title sponsor of the HITS Ocala Winter Circuit’s 30th Anniversary Season Finale, the $100,000 DeLuca Toyota Tundra Grand Prix, presented by Great American Insurance Group on Sunday, March 20 to close out the 2011 show season. Since 2008, DeLuca Toyota Tundra has been the proud sponsor of this big-ticket event, which in its 13-year history has seen the likes of Aaron Vale, Laura Linback, Ian Silitch, Mike McCormick and Tracy Fenney take home the coveted win. Perhaps even more exciting, once again the $100,000 DeLuca Toyota Tundra Grand Prix, presented by Great American Insurance Group, will be a crucial qualifier for the 2011 Pfizer $1 Million Grand Prix. Last year, Texas’ own Tracy Fenney used her victory in the $100,000 DeLuca Toyota Tundra Grand Prix to propel her to the top of the Pfizer Million Rider Rankings. With a first-place payout of $30,000, it’s safe to say that High-Performance riders looking for their shot at this year’s Pfizer Million will have this event on their radar. A testament of their commitment to the Ocala community, DeLuca is also providing the winner of the WTRS Radio Station’s “Ocala is a HIT” National Anthem Contest a check for $500. Are you looking to buy or lease a new car? DeLuca Toyota is the premier dealership of Ocala and offers the most extensive line of Toyota and Scion vehicles in the state. Located at 1719 SW College Road, Highway 200 West in Ocala, DeLuca Toyota offers big savings on preowned and certified preowned vehicles, which are backed with a seven year, 100,000 mile warranty. DeLuca Toyota has all your vehicle needs to choose from. Striving for 100% customer satisfaction in all their sales and services, DeLuca Toyota offers the best selection on sales, rentals and repairs as your number one vehicle stop while at HITS Ocala. Whether it’s a car, minivan, truck or SUV, DeLuca Toyota can trade-in, get you credit approved and find available rebates for a comfortable and affordable experience. You won’t have to go far this winter to see what DeLuca Toyota has to offer. A full line of vehicles will be displayed all season on-site at HITS Post Time Farm alongside the berm at Jumper 1 for you to explore, as well as speak to a DeLuca representative for any questions or needs you may have. From 100,000 miles to the $100,000 Grand Prix; Toyota makes the car, DeLuca makes the difference! For more information on DeLuca Toyota, please visit DeLucaToyota.com. 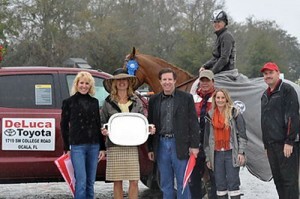 The 2011 HITS Ocala Winter Circuit begins January 19 for two consecutive weeks of unrated competition at HITS Post Time Farm. Starting February 8, the AA-rated circuit begins for six consecutive weeks and will culminate on Sunday, March 20, as the $100,000 DeLuca Toyota Tundra Grand Prix, presented by Great American Insurance Group, takes the stage as the biggest finale event of the season. The 2011 show season will feature a full exciting lineup of classes and special events, which include 14 Grand Prix qualifiers for the 2011 Pfizer Million and five Devoucoux Hunter Prix qualifiers for the inaugural $500,000 HITS 3’3″ Hunter Prix Final. Both historic events will take place during the Pfizer Million Weekend at HITS-on-the-Hudson on September 10-11. HITS, Inc. produces high-quality, international-level hunter/jumper horse shows. Based in upstate New York in the village of Saugerties, HITS has been producing shows since 1982 and is now a nationwide company with world-class circuits in California, Florida, Arizona, New York and Virginia. In 2010, HITS took the industry to new heights when it hosted the first-ever Pfizer $1 Million Grand Prix. HITS will once again offer the most innovative weekend in show jumping history in 2011 when it hosts the second annual Pfizer Million and the inaugural $500,000 HITS 3’3″ Hunter Prix Final, September 10 -11, at HITS-on-the-Hudson in Saugerties, New York. For more information and a complete schedule of classes and events, visit Media_Info@HitsShows.com. Entry date: February 21, 2011, 5:38 pm. You can follow any responses to this entry through RSS 2.0. Responses are currently closed, but you can trackback from your own site.